Model G20 participants on the final day of the conference in 2017. 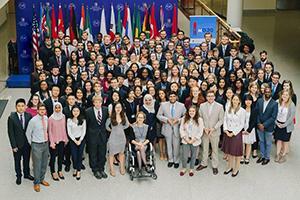 The Model G20 Initiative is a program launched by American University’s School of International Service, and AU students are already ramping up for the October 2018 event. Organizers of the conference simulate a real-life G20 summit, and Cecilia Nahón, Model G20 Initiative executive director, vouches for its authenticity. She’s well-positioned to know: Nahón was formerly Argentina’s ambassador to the US, and she spent four years as her country’s Sherpa (i.e., a delegation head) at the actual G20. “Last year we were all very impressed with how realistic the simulation was. It really felt like we were on the G20 for a while,” she recalls. The goal, Nahón says, is to get students thinking—and participating—like skilled diplomats confronting a variety of global challenges. In addition to Nahón’s leadership, SIS faculty member Andrew Spath is the Model G20 Initiative’s associate director. Last year, a group of mostly SIS students comprised the country team of Germany, which held the G20 presidency. This year, a similar group will represent Argentina, the current G20 chair. Model G20 teams include students from across AU and other universities, and young professionals at DC institutions such as the World Bank also participated. Replicating the actual G20 structure, conferences proceed along two tracks: Finance and Sherpa. The topics for Sherpa are climate change and energy, gender equality, and migration and refugees. For Finance, they cover the future of work, international trade and tariffs, and global tax cooperation. Whatever the topic, collaboration is the name of the game. “We most pride ourselves on the ability to provide a place for delegates to learn negotiation skills, and learn how to cooperate with people,” says Mya Zemlock, an SIS student who helped write the final communiqué. “Students are really pushed to keep on negotiating for common solutions, even though they may come from very different starting points. Unless all the countries approve—for example, a position on international trade or global tax cooperation—the issues are not solved,” says Nahón. The final communiqué is crucial, as the G20 leaders draft a statement addressing their views on issues and shared commitments. The communiqué ensures that all countries and stakeholders must forge consensus. Hammering out that communiqué is tougher than outsiders assume. It underlines—and gives students newfound appreciation for—the extreme pressures real diplomats face. Before the Model G20, students extensively research the country that they’ll represent. This can include working with government officials, as the German and Chinese embassies in Washington helped out last year. With each team protecting its own interests, disagreements are inevitable once proceedings get underway. The German team, for instance, started with substantial ideological differences from the US on immigration and climate change. The 2017 Model G20 occurred after the real G20 proceedings, and Trivedi calls this both a curse and a blessing. On one hand, you can get boxed into a position. But with the benefit of hindsight, you can purposely avoid perceived missteps that countries made. “In working on climate change, we didn’t want to single out the United States. That’s what actually happened in Hamburg, where a special line in the communiqué said the United States was not involved in any of this. So we were trying to prevent that from happening in the simulation,” he says. Both Zemlock and Trivedi believe Model G20 provides quality career preparation. Trivedi is set to graduate in December, and he’s considering work in diplomacy or the think tank world. Zemlock, a rising junior, has a regional focus on Russia, and she’s open to policy work in this area. In advance of the October Model G20, AU students are already researching issues pertinent to Argentina. Beyond direct homework, they’ve gained a better grasp—as news consumers and global citizens—of high-stakes international negotiations.